If you’re looking for a way to get around in Cuyahoga County, look no further. You have found the premium taxi cab service for Cuyahoga County and outlying areas. Your transportation needs can be met with Beachwood Transportation. Our team of drivers are highly professional and will provide you with a hassle-free and stress-free transportation experience. We strive to accommodate our clients at their convenience and offer customer service that is second to none. Call (216) 800-6565 Now to make a reservation! Our Beachwood taxi service offers reasonable rates for our transportation services. Our fleet of vehicles are insured, immaculately clean and well maintained. Our airport taxi service operates around the clock ensuring on time arrivals for our clients earliest flights. We are the company you can turn to when you need dependable airport shuttle service and transportation in the greater Cuyahoga County area. 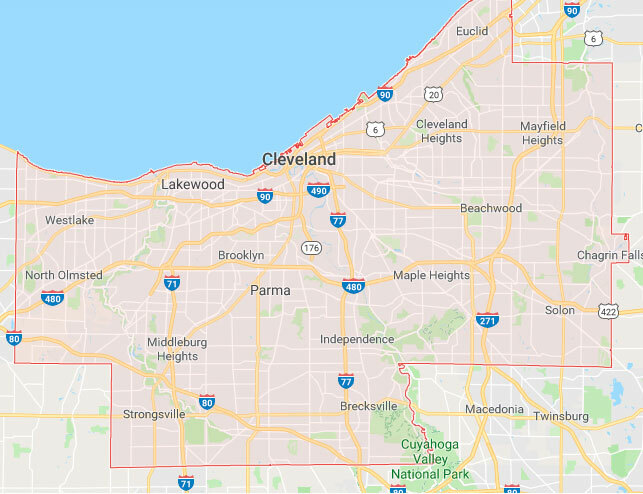 Cuyahoga County is the most populous county in Ohio. The name comes from the Iroquois word meaning, crooked river, which describes the Cuyahoga River. Beachwood Transportation serves all of Cuyahoga and Lake County with taxi cab, limousine, and airport shuttle services. The Solon, Beachwood and Mayfield Heights area was named ‘one of the best places to live’, by Money Magazine. Solon is considered one of the safest cities in the state. Their school district is one of the top 10 in Ohio. Solon was recognized by Google as the ‘strongest online business community’ in Ohio. Solon has an extremely innovative re-cycling system that involves the entire community not only in re-cycling all kinds of items but composting plant materials and yard waste as well. Mayfield Heights shares the Mayfield City School District with Highland Heights, Mayfield Village, and Gates Mills. Mayfield Heights was initially developed as a streetcar suburb. It was incorporated as a village in 1925 and as a city in 1951. Mayfield Heights derives its name from Mayfield Township, now defunct. Cleveland Heights was incorporated in 1921 and that makes it one of the oldest cities in the county. University Heights, its neighbor, was named the ‘City of Beautiful Homes’ recently. Cleveland Heights and University Heights share a school system, library system, post offices and zip code. University Heights was named such when John Carroll University was located here in 1935. The city was incorporated in 1940. Shaker Heights is located on the eastern edge of Cleveland. It was formed in 1911 by a petition of citizens wanting to detach from Cleveland Heights. As a planned community, it was envisioned as a suburban retreat from industrial Cleveland. The oldest house in Cuyahoga County is in Shaker Heights. It was built in 1817. The name of the city comes from a Shaker community settled here in 1822. By 1850 there was a population of 300. But by 1889 the settlement was abandoned. The ‘Heights” word is from a sharply rising plateau some 580 feet above sea level in the area. The word “Heights’ in neighboring Cleveland Heights comes from this same plateau. Nearly 70% of Shaker Heights is listed on the National Register of Historic Places. This is maintained with the use of strict building codes and zoning laws in Shaker Heights.